I don't know about you, but do these creatures freak anyone else out? 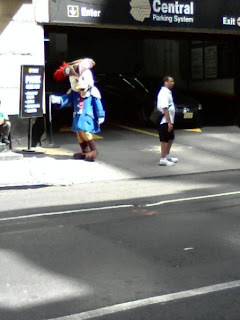 New York City hot spots, such as Times Square, have characters coming out as if we were in Disneyworld. Quite frankly, they are extremely creepy versions of Nickelodeon and Disney characters. They also tend to have a Spiderman here and there along with Freddie Kruger and Michael Myers. Tourists find them funny and entertaining. But I on the other hand am freaked out. Spongebob is more of neon lime green color and Mickey and Minnie are decked out in these weird, sequined outfits. When I see them, I turn the other way. When they wave, I'm sure I have a look of absolute horror on my face. Does anyone even know who that duck is supposed to be? We are a local chain of independent bookstores. Our shops are in close proximity to major universities in the NYC area including Baruch College, Brooklyn College, Cooper Union, NYU, Hunter College, Marymount Manhattan College, The New School, School of Visual Arts. All locations are accessible via public transportation. Plus, we buy books all year round. The opinions expressed in posts represent those of the respective author(s) and not those of Shakespeare & Co.